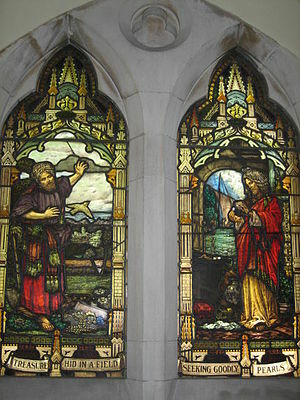 The Parable of the Hidden Treasure (left) paired with the Parable of the Pearl (right) on a stained glass window in Scots' Church, Melbourne. The Parable of the Pearl (also called the Pearl of Great Price) is one of the parables of Jesus. It appears in Matthew 13:45-46 and illustrates the great value of the Kingdom of Heaven. It is the penultimate parable in Matthew 13, just before the Parable of the Dragnet. It immediately follows the Parable of the Hidden Treasure, which has a similar theme. It does not appear in the other synoptic gospels  but a version of this parable does appear in the non-canonical Gospel of Thomas, Saying 76. The parable has been depicted by artists such as Domenico Fetti. The Pearl of Great Price, by Domenico Fetti, 17th century. and theologian John Nolland likewise notes that pearls at that time had a greater value than they do today,, and it thus has a similar theme to its partner, the parable of the Hidden Treasure. Nolland comments that it shares with that parable the notions of "good fortune and demanding action in attaining the kingdom of heaven", but adds in this case the notion of "diligent seeking". The valuable pearl is the "deal of a lifetime"  for the merchant in the story. However, those who do not believe in the kingdom of heaven enough to stake their whole future on it are unworthy of the kingdom. O that Pearl of great price! have you found it? Is the Savior supreme in your love? As you hope for a welcome above. Have you given up all for this Treasure? Have you counted past gains as but loss? Come to naught before Christ and His cross? 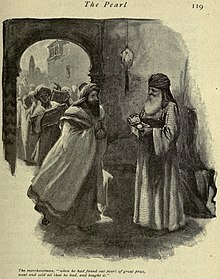 A less common interpretation of the parable is that the merchant represents Jesus, and the pearl represents the Christian Church. This interpretation would give the parable a similar theme to that of the Parable of the Lost Sheep, the Lost Coin, and the Prodigal Son. The phrase "Pearl of Great Price" has also been interpreted more widely to apply to things of great value in a number of religious contexts. For example, it is the title of a selection of Mormon writings. Pope Pius XII used the phrase to describe virginity. The pearl itself is a beautiful, single entity, formed through suffering in the heart of the oyster (in the same way that believers endure lack of wealth or comfort) and like the Church, will be put on display in a coming day. Unlike precious stones which must be cut and polished to reveal their clarity and beauty, the pearl is perfect as it comes from the oyster. Jesus said, "The Father's kingdom is like a merchant who had a supply of merchandise and found a pearl. That merchant was prudent; he sold the merchandise and bought the single pearl for himself. So also with you, seek his treasure that is unfailing, that is enduring, where no moth comes to eat and no worm destroys." This work's version of the parable of the Hidden Treasure appears later (Saying 109), rather than immediately preceding, as in Matthew. However, the mention of a treasure in Saying 76 may reflect a source for the Gospel of Thomas in which the parables were adjacent, so that the original pair of parables has been "broken apart, placed in separate contexts, and expanded in a manner characteristic of folklore." In Gnostic thought the pearl may represent Christ or the true self. In the Gnostic Acts of Peter and the Twelve, found with the Gospel of Thomas in the Nag Hammadi library, the travelling pearl merchant Lithargoel is eventually revealed to be Jesus. There have been several depictions of the New Testament parable in art, including works by Domenico Fetti, John Everett Millais, and Jan Luyken. "But she named the infant 'Pearl,' as being of great price- purchased with all she had,- her mothers only treasure!" ^ a b Gospel of Thomas: Lamb translation and Patterson/Meyer translation. ^ a b c d John Nolland, The Gospel of Matthew: A commentary on the Greek text, Eerdmans, 2005, ISBN 0-8028-2389-0, pp. 565–566. ^ Craig S. Keener, A Commentary on the Gospel of Matthew, Eerdmans, 1999, ISBN 0-8028-3821-9, p. 392. ^ The Cyber Hymnal, O That Pearl of Great Price! ^ Herbert Lockyer, All the Parables of the Bible, Zondervan, 1988, ISBN 0-310-28111-3, p. 200. ^ Pope Pius XII, Sacra Virginitas. ^ a b c d Brad H. Young, The Parables: Jewish Tradition and Christian Interpretation, Hendrickson Publishers, 2008, ISBN 1-59856-303-3, pp. 202–206. ^ David Noel Freedman, Allen C. Myers, and Astrid B. Beck, Eerdmans Dictionary of the Bible, Eerdmans, 2000, ISBN 0-8028-2400-5, p. 1041. ^ Hawthorne, Nathaniel (1878). The scarlet letter. The Library of Congress. Boston, J.R. Osgood and company.